Today was the first day of StarMegaDo3 for those of us only doing the North American section. It starts in Chicago, and as you recall from last night, I was still staring out the window at a wall in Las Vegas. That means another really early morning and two more flights. The good news, however, is that I got my first ever upgrade on a Delta flight. I'm used to getting upgrades on Alaska (I got one yesterday on the Seattle-Las Vegas leg) but I've never managed to figure out the system that Delta uses well enough to even get myself on the list, never mind actually get the upgrade. A couple of months ago though, Delta changed their systems, and now Alaska elites automatically get their upgrades requested. We're still bottom of the barrel, but at least we can get on the list now. Of course before I get too excited about getting an upgrade I should point out that there were only about 70 people on a plane that holds 182. They were literally walking through the back of the plane looking for people to upgrade, and we still took off with two empty seats in First Class. If I'd have stayed in coach I probably would have gotten a row to myself, but what kind of story would that be? So what do you get in First Class on Delta? Well, when you board the plane there are two bottles of cold water waiting for you at your seat. Ours sat there all through the flight, falling off every time the plane banked even a little. Then after we got up past 10,000 feet, they came around with hot towels. I'm really glad that I wasn't sitting at the front of first class as I wouldn't have known what to do with the hot towel. I think I saw in a movie once that you're supposed to lay back and drape it over your face. Apparently everybody else just uses it to wipe their hands. I wonder how long they would have left me sitting there with a towel draped over my face? After the towels, came breakfast. Thank you Delta for not following the others lead and trying to serve eggs for breakfast. I love eggs, but microwavable eggs in a confined space doesn't make for a fun cabin. Cereal, yogurt, fresh fruit and a muffin made for a perfect breakfast. Except for the gentleman sitting next to me who was gluten intolerant. He got rice cakes. Poor guy covered them in about an inch of honey, but still couldn't eat them. 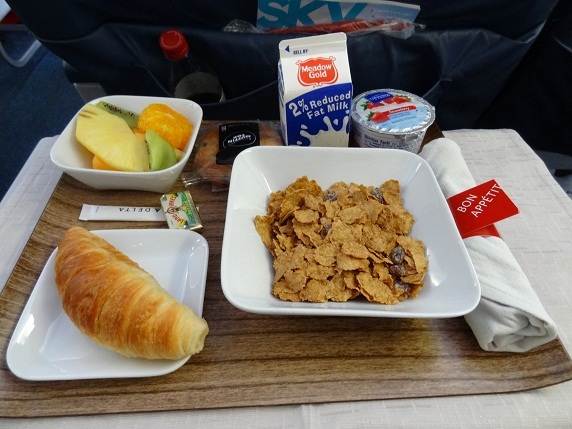 Fortunately for him, after breakfast the flight attendants came around with a big basket of snacks. I wouldn't have guessed that Reese peanut butter cups are gluten free, but I guess they are. You can't really see it in this picture, but there's a tablecloth! Fancy! Then there are the seats. To be honest, leaving Las Vegas at 6am the only thing I really care about is that the seats are on the inside of the plane, but after that minor qualifying detail, the first class seats on Delta are really comfortable. Probably more so than the Alaska seats, although that may have been a factor of how tired I was. The bad part is that there's not much room to store things under the seat in front of you. It's not really necessary as Delta separates their bin space fairly well so there's plenty of room up top, but I prefer to have my stuff available to me without having to get up. Minor complaint, and certainly not a huge negative by any stretch. If we're going to cover minor complaints though, what's with the ancient monitors that drop down from the ceiling? I understand that they're upgrading their planes, but every time I see one of these old tube contraptions I wonder if Delta and Harrahs shop at the same place for TVs? You could almost just tape an iPad up there and have a better in-flight entertainment system than the TVs you're using now. Fortunately, it was a boring movie, so nothing lost. Overall I enjoyed the Delta first class experience. The service was very good, although that may have had something to do with the other two flight attendants only having 10 or 12 people each to take care of in coach. Hopefully the system switch by Delta is enough to let me find myself on their list for upgrades again. I recommend it for everybody except the gluten intolerant. They might want to fly Alaska.